Chef Duane Nutter began his culinary career in 1994, studying under well-respected Chef Daryl Evans at the Four Seasons Hotel in Atlanta. Nutter went on to work at the Ritz Carlton in Palm Beach, FL before making his next big move in 2004 to Louisville, Kentucky’s Seelbach Hilton’s Oakroom. The Oakroom is one of only 48 AAA Five-Diamond restaurants in the world. Nutter became chef de cuisine and received incredible reviews, especially on his “complex interpretations of seemingly simple dishes.” He continually enjoys surprising guests with new twists on old favorites. In 2006, Nutter was invited to compete on the Food Network’s “Iron Chef America” and he cooked at the prestigious James Beard House in New York City the following year. He has been praised in a variety of highly regarded publications such as Garden & Gun, Men’s Journal, Delta Sky Magazine, Coastal Living, Condé Nast Traveler, and Details. In 2008, with a new vision and challenge in mind, Nutter accepted the position as One Flew South’s executive chef and used his imaginative execution to blend southern ingredients with world travel influences into the dishes for the first upscale travel-dining restaurant in the world’s busiest airport. 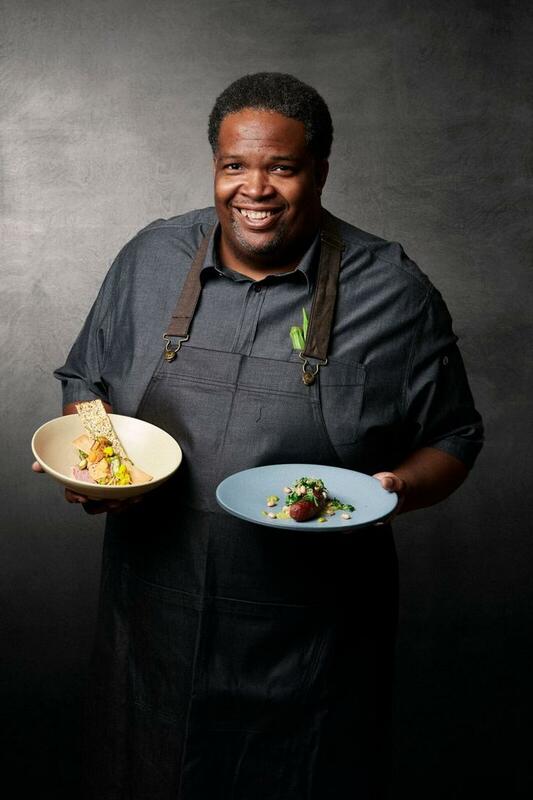 In 2017, Nutter relocated to Mobile, AL to open Southern National with restaurateur and friend, Reggie Washington. Nutter now offers Mobile a taste of his award-winning ‘Southern National’ cuisine, and in four short months after opening the restaurant was proudly named a 2018 James Beard Semifinalist for Best New Restaurant. In addition to his innovative culinary talent, Nutter has a knack for his hobby as a standup comedian. He was a semi-finalist in Comedy Central’s “Laugh Riots” and was known around Atlanta as the hilarious “Mad Chef.” These days, Nutter will occasionally perform in a comedy club, but spends most of his time mastering his ability in the kitchen.